On my second flight to Singapore this 2018, I find myself booking a room again at Holiday Inn Express in Katong. I would normally look for hotels near train stations, but this one is an exception. 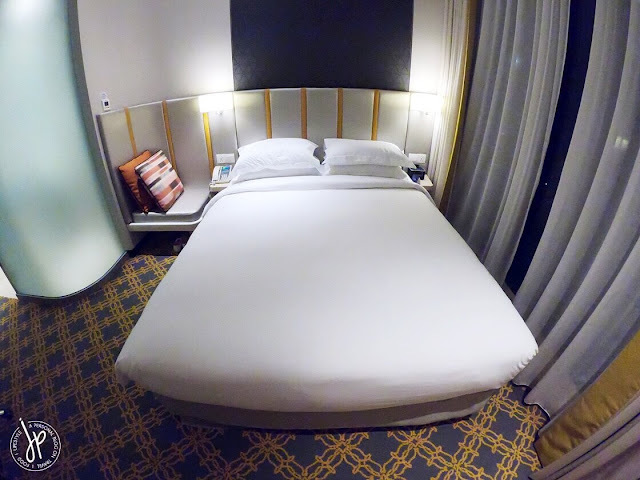 Tucked in the vibrant and posh area of Singapore’s East Coast, I was surprised to find a brand that carries a hotel legacy in its name, but doesn’t come along with an expensive price tag. I don’t do backpacking when I travel, but I do want some comfort at the end of the day without having to break the bank. 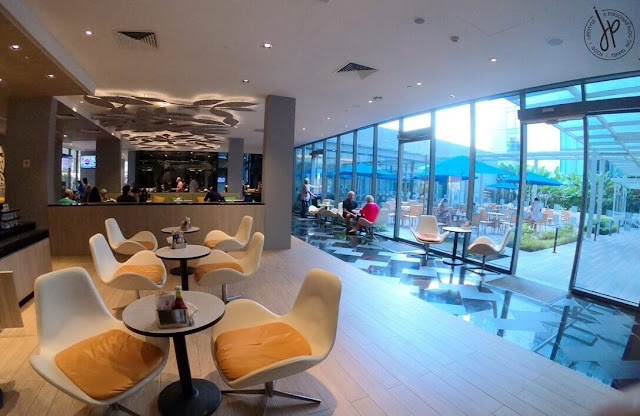 If you’re looking for a mid-range hotel that values top-notch service without paying a fortune, this Holiday Inn branch might be the one you’re looking for. 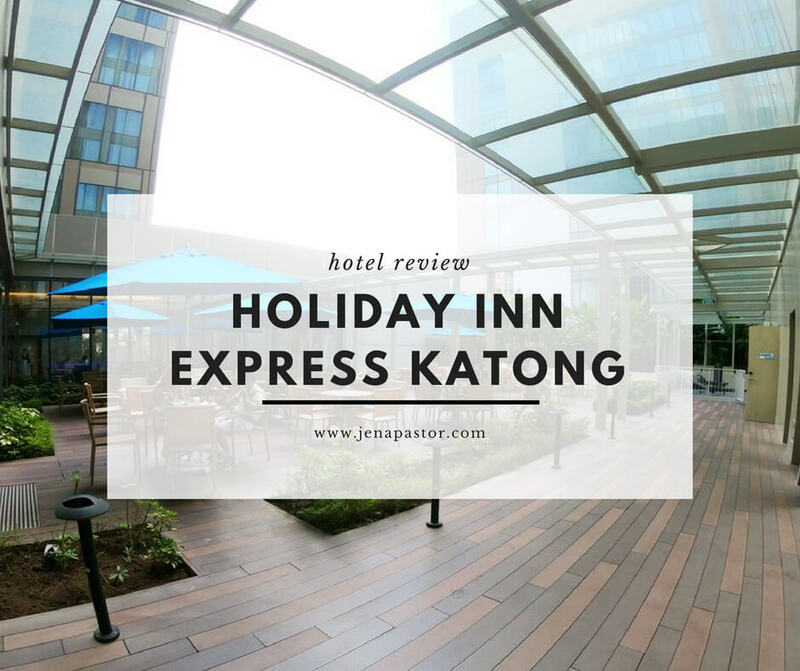 Despite being away from the train line, Holiday Inn Express Katong is only 2-5 minutes on foot from at least three bus stations. I usually pick hotels that are nearby train or subway stations over bus access because the former mode of transportation is easily recognizable and the routes are simple. The travel time is quicker, too. However, I realized the convenience of taking the bus, especially if you find yourself riding the double decker ones. Find a seat at the second storey and you’ll get a great view of the city, as if you’re riding a hop-on, hop-off bus with just a fraction of the cost. Within 30 minutes to an hour by bus, you’ll be able to reach popular destinations such as Suntec City, Orchard, Bugis, Marina Bay Sands, Merlion Park, and Gardens by the Bay. 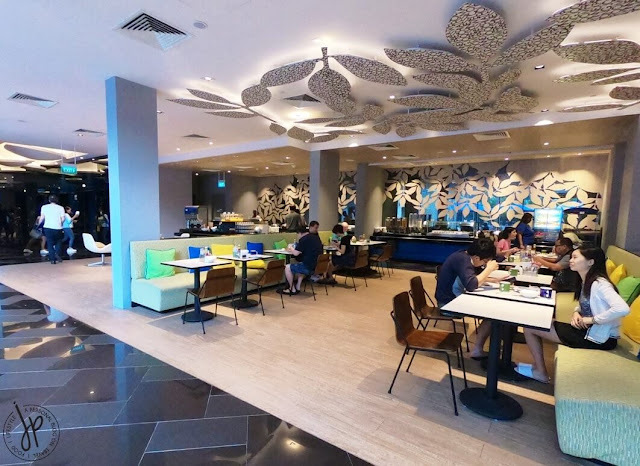 Aside from transportation, the hotel is also near two supermarkets: Katong Market Place at 112 Katong Mall and FairPrice Finest at Katong V, which are all 2-4 minutes away on foot. Convenient stores (such as 7-Eleven) are also nearby. The East side of Singapore is known to host tremendous number of food options and various cuisines. If you’re a tourist who like to immerse your palette in different flavors, this is the place to be. Even cab drivers who took us to Holiday Inn tell us that we picked a good location. You'll also find Peranakan culture and terrace shops and houses in this area. Food and nightlife are popular in Katong and you’ll discover endless choices of Asian and Western cuisine, pubs, fruit stands, and dessert shops. You’ll even find hawker centers along Joo Chiat road. The East has something in store for you, no matter what budget you may have. Some of the stores near the hotel are Starbucks, Tim Ho Wan, Mookata Thai BBQ, Five Star Hainanese Chicken, and my favorite cake and ice cream shop, Awfully Chocolate. 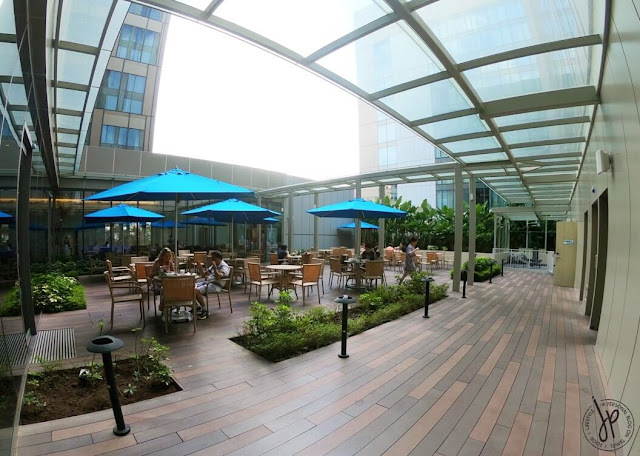 Holiday Inn Express in Katong, Singapore is more than just your basic hotel accommodation. Aside from it being one of the newest hotels in town, Holiday Inn has a gym and laundry area near the outdoor dining hall. Beside the laundry room are toilets for men and women. Ice cream and fresh orange juice vending machines (which my husband and sister like) are available near the lobby and reception areas. There’s also a small bar where you can purchase drinks, sandwiches, croissants, and snacks which are surprisingly reasonably priced. However, if you’re looking for an accommodation with a swimming pool, you won’t find it here. Guest checking-in or checking-out? They have a large luggage room where they can store your belongings. We booked a standard size room with a queen size bed. 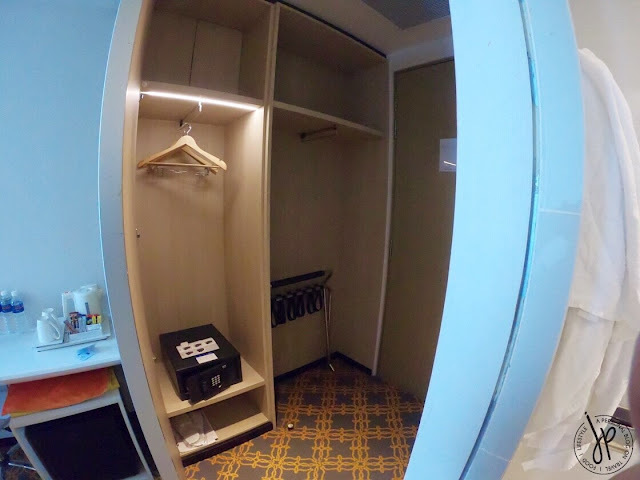 The entire room measures 19 sqm and it’s still quite spacious for two people with two large pieces of luggage. The whole hotel is equipped with free WiFi, including the guests’ rooms. 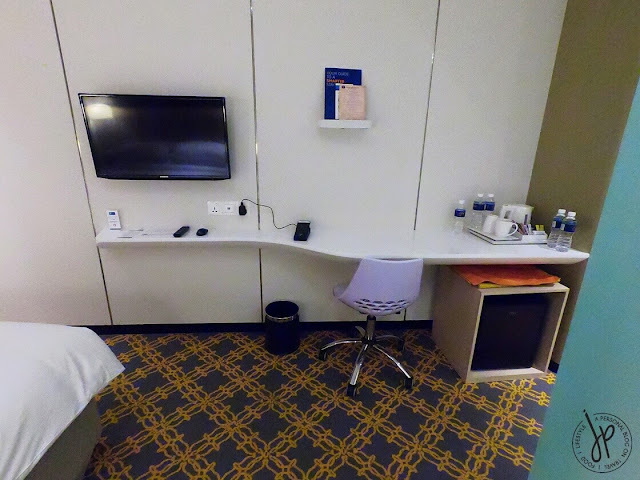 The standard room has a carpeted floor which helps minimize sound and noise, but a bit difficult to drag heavy luggage. Near the bed is an alarm clock, telephone, and wall sockets (bring your own adaptor). Just like in any other Holiday Inn hotels, this Katong branch provides guests an option to use both soft and firm pillows as well. In front of the bed is a flat screen TV (cable channels available) attached to the wall. On the same side of the TV is a desk, lamp shade, small fridge and complimentary bottled water, tea, instant coffee, mugs, teaspoon and electric kettle. Near the bedroom door is a built-in closet with a full-length mirror. Inside the closet are hangers, laundry bag, bedroom slippers, and an in-room safe box. In my opinion, I would consider a booking worth the money if the room I’ll be staying in has a more than decent bathroom and toilet space. 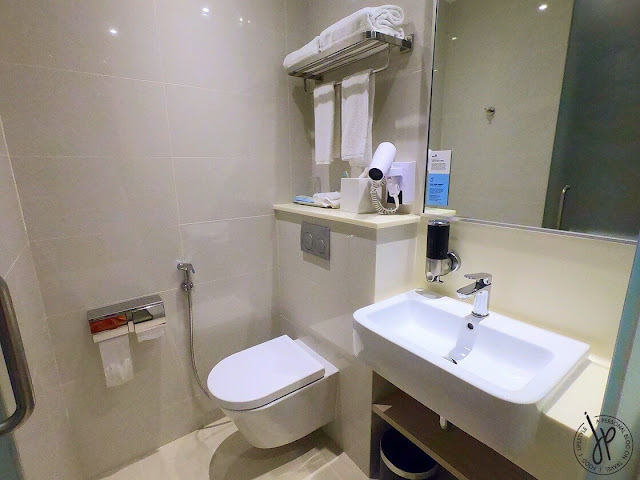 In our standard room at Holiday Inn Express, the bathroom is spacious, making it easy to move around without bumping into fixtures. Bath, hand, and face towels are available in the top rack. 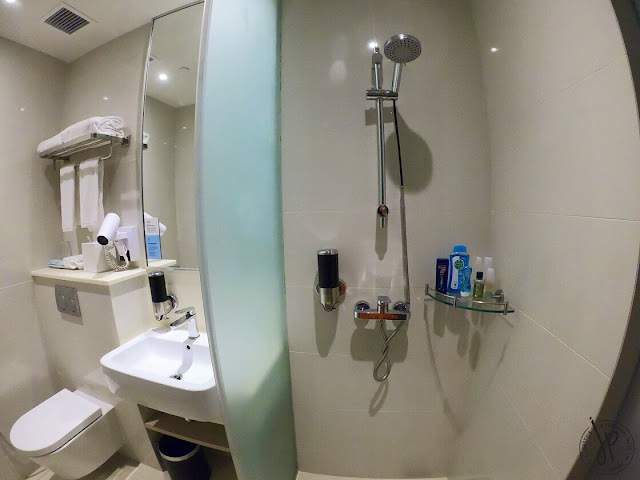 Beside the toilet is the toilet paper and handheld bidet. Behind the toilet is a shelf with all the toiletries (toothbrush and toothpaste, etc.) and a hair dryer. Near the sink is a built-in hand soap dispenser. 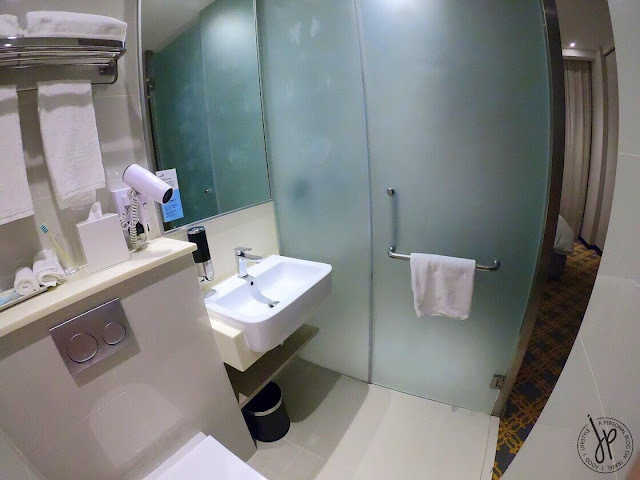 The shower area is equipped with hot and cold shower, a fixture for where you can put your bath essentials, and a built-in dispenser for an all-in-one shampoo and body wash. 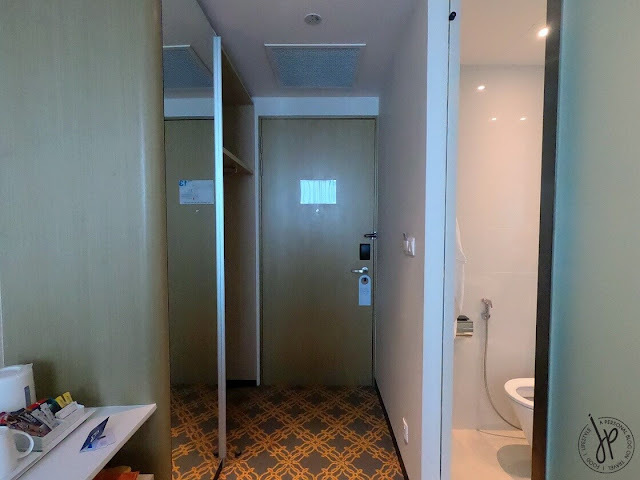 The toilet door doubles as a shower door, too. Both the door and the shower wall are made of frosted glass so that’s one thing to note if you’re sharing a room with another person. There isn’t a bathtub available for the standard room. If you’ve been to several Holiday Inn hotels in the past, all I can say is that they are the best when it comes to assisting customers and their needs. Not only are the staff polite and professional, but they’re also very helpful. The rooms are kept clean at all times, toiletries replaced, and water bottles replenished. The front desk staff allowed us to check-in early at 10:00 AM when there was an available room (usual check-in time is around 2:00 or 3:00 PM). They are patient with guests who were asking for directions on how to reach a particular place using Singapore’s public transportation. Furthermore, I appreciate the fact that when some guests try to cut in line at the front desk, the staff politely directed them to queue up. 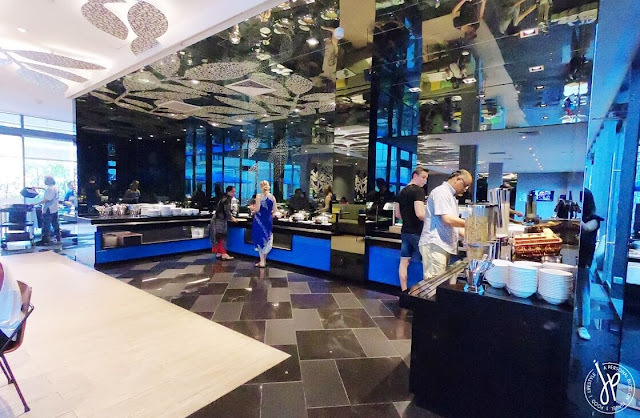 One thing you’ll notice at the lobby and reception area is their huge dining space commonly used for buffet breakfast. Plenty of western and Asian choices such as noodles, congee (my favorite), scrambled eggs, beans, fried rice, ham, sausages, croissants, bread, cheese, yogurt, cereals, and a variety of fruits to name a few. Water, coffee, tea, and fruit juices are also available. Singapore offers a wide range of hotel and accommodation choices that fit your spending budget. Most of the time, however, you get what you pay for. 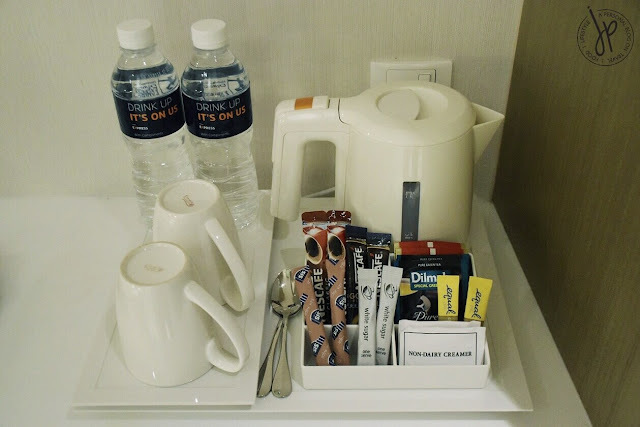 But with Holiday Inn Express Katong, you’re getting value for your hard-earned money. Did I mention I got the standard room for less than Php 4,700 per night during my vacation? 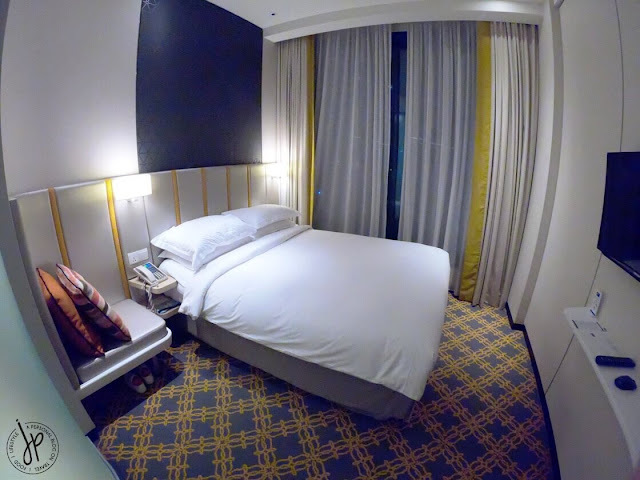 Staying here twice on separate occasions only proves that the hotel is a convenient, accessible, and safe place to be in while you’re enjoying your time at The Lion City. Disclaimer: This is not a sponsored post. The contents of this entry are purely my opinion and 100% honest based on my booking experience and accommodation. To secure your booking faster, I included direct links to Agoda on this hotel property.